Attention introverts! Create the life and business you want…. Not everyone is outgoing, polished, courageous, and loud. 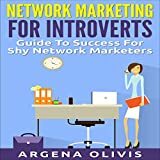 In this book you’ll discover how you can be yourself and still crush it in your network marketing company. Take action! Download your copy today!